The mystery of the secret cave in 16m Hardmode TFB and its connection to Dreadtooth was revealed earlier by members of the Carnage Gaming raid team. 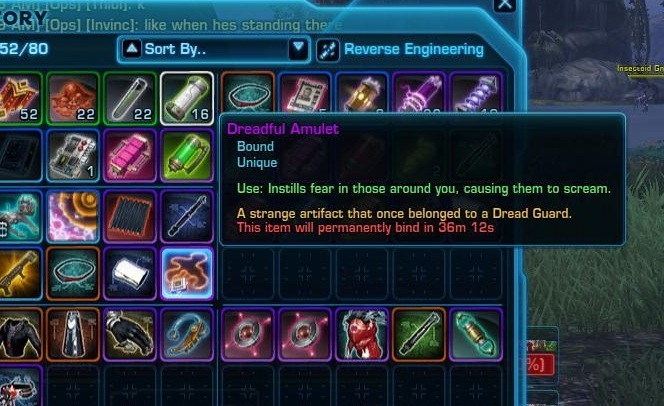 Dreadtooth, the world boss in Section X, killed at 10 stacks (requires a 24 member raid team) drops Dreadful Amulet. This Dreadful Amulet can be brought into the secret cave area of 16m hardmode Terror from Beyond (before the second boss, near a bridge) to spawn the secret boss known as Dreadful Entity. Any instance of 16m hardmode Terror from Beyond will work for this, even if it is cleared already. The Amulet has a 23 hr cooldown (meaning the secret boss can be summoned only once 23 hrs) but you can trade it (within the 2hr limit once looted) to someone else and have them use it (i.e. cooldown timer on the amulet is player specific). You can also kill Dreadful Entity multiple times within the 2hr bind timer by trading it to someone else, reset the instance, and then summoning Dreadful Entity in a new instance of Terror from beyond. You must wear Dread Guard’s Corrupted Mask in the fight again Dreadful Entity. This will protect you from his Dread Touch ability. Dreadful Entity, once killed, drops the Dreadful Orb and reward players with the title Dread Slayer and a codex entry with the same name. It is currently unknown what Dreadful Orb is used for. The orb turns you what looks like a Hypergate Anomaly for 15 seconds and can be used on anyone – i.e. friendly players or mobs. It has a 23 hr cooldown. Dreadful Entity can be spawned in the cave just under and to the left of the bridge in 16m Hardmode Terror from Beyond that leads to the Dread Guards boss. Players approaching the cave will receive a red message on their screen alerting them to a chilling presence. Everyone in the raid must be wearing Dread Guard’s Corrupted Mask, which drops from any difficulty of Dreadtooth. This mask protect you from Dreadful Entity’s Dread Touch ability, which is assumed to be an instant kill ability. The player with the Dreadful Amulet will need to head inside the cave and click it to spawn Dreadful Entity. This person will be stunned until Dreadful Entity is pulled away by other members of the raid. Dreadful Entity is a very easy boss compared to Dreadtooth 10 stacks. You will need the standard 2 tanks, 4 healers, and 10 DPS. 2 sorc/sage healers is recommended for the AoE healing bubble. Your entire raid will be kiting Dreadful Entity a fairly long distance. 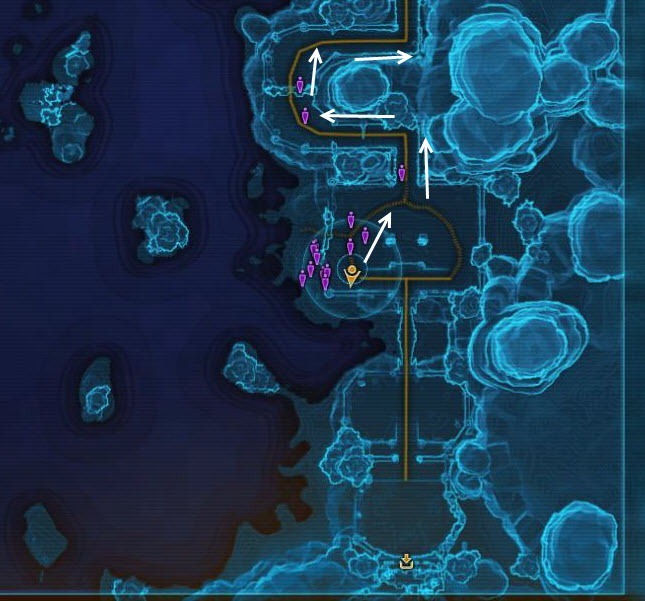 Here is the path we took (towards the raid entrance). Melee DPS will take a bit more damage than ranged DPS due to their proximity to the ground AoE spawned by the boss (more on that below). 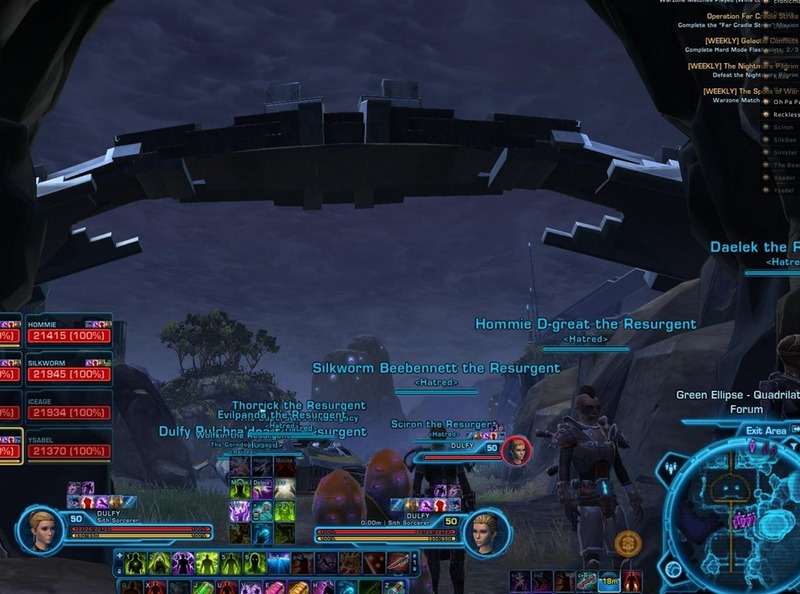 We did not engage Dreadful Entity until we pulled him around the corner to prevent us from getting pushed into exhaustion zone. Dreadful Entity has 6.2 million HP with an unknown enrage timer. Most raids will have killed him within 9-10 minutes. He also has two buffs on him. Periodically, Dreadful Entity will casts Dreadful Awakening, this spell will increase his stacks of Ancient Wrath by one, causing him to do 5% more damage but remove his stacks of Ancient Slumber by one, allowing the raid to do more damage to him. Most raids will have killed the boss once he reached 15 stacks of Ancient Wrath. In terms of debuffs on the raid, everyone will receive a debuff called Pulse Guard, which caps out at 10 stacks. This buff reduces the damage from Dreadful Void (the AoE orbs left on the ground by the boss) by 5% per stack for a damage reduction up to 50%. In addition, everyone will receive a Dread Touched debuff, making you immune to the Dread Touch attack (huge knockback + 5k damage) until it wears off. Despite these being debuffs, they are actually beneficial. The tank tanking Dreadful Entity will receive a debuff called Lingering Shock. It persists for 30s and increases the damage taken from Shock by 2% per stack. Our tanks swap once this counter reaches 6 but it is an arbitrary number. Dreadful Pulse – AoE knockback (about 10m) that deals 4-7k damage (damage increases with each stack of Ancient Wrath) and give a stack of Pulse Guard to those affected. Dread Touch – Massive AoE knockback (about 35-40m) that deals 5-7k damage. This is a targeted knockback on a single raid member. Once you get hit by this ability, you get the Dread Touched debuff that prevent you from getting hit by it again for another 1-2 minutes. This attack does not seem to affect the tank with threat on the boss. 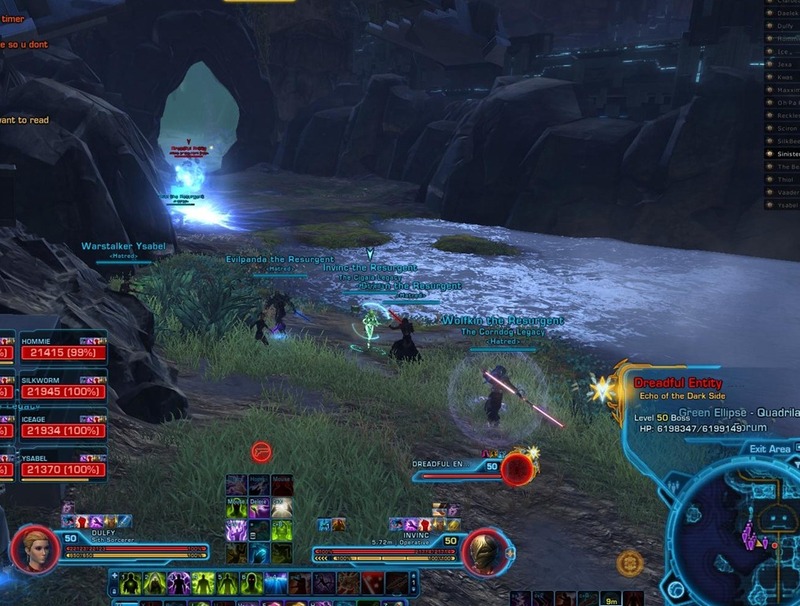 Dreadful Void – AoE pulsing damage from the “orbs”. Deals around 1.5-1.6k damage per tick. Shock: a direct attack on the tank with threat. The overall strategy of the fight is to kite the boss around, moving every time you see an orb dropped on the ground. Entire raid should be in front of the boss so that no one is in the vicinity of the Dreadful Void (boss does not have a cleave). DPS on the boss will be low initially but gradually picks up as stacks of Ancient Slumber wears off. Tanks will need to swap as they get increase stacks of Lingering Shock. We tank swapped at 6 stacks but it is an arbitrary number. Of the four healers, you will want two on raid healing, dropping AoE heal bubbles. The other two can focus on tank healing and raid healing as needed. 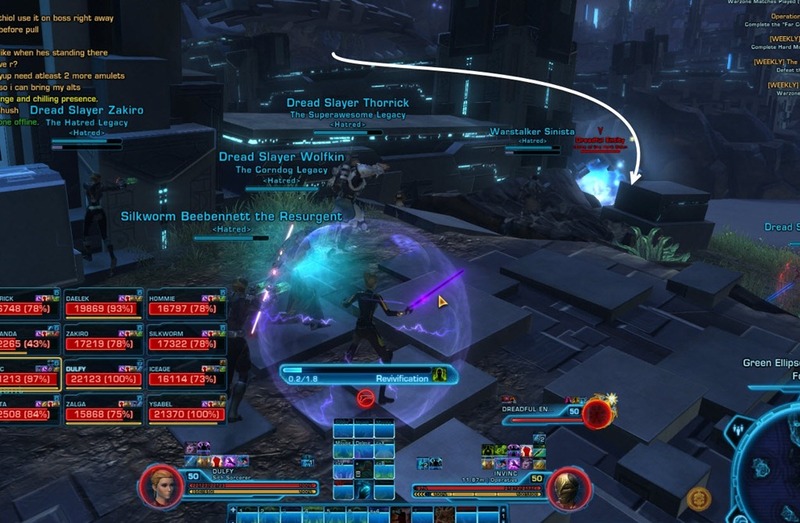 This is fairly easy fight so if you killed Dreadtooth at 10 stacks, this one should be a walk in the park.